Discussion in 'Transformers Toy Discussion' started by Arcee's_Boy, Aug 19, 2010. Does anyone know when this is going to be available? Is this even made by Fansproject? I did a forum search and coundn't even find a thread on it. Isn't this just a custom meant to look like it's from the same line as the Defender figure? Ever seen it. If it's legit it looks ready for production! 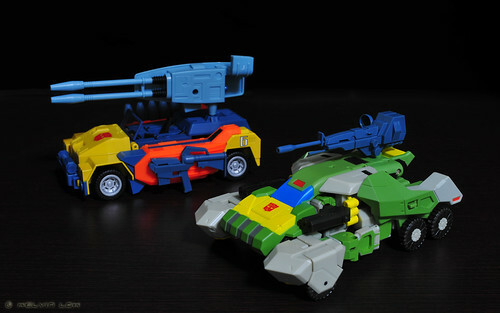 Where's Roadbuster?!?!!! I've never heard of it, but it looks pretty damn good. Not overly impressed by that. Not sure, can anybody translate the page for us? It looks like a kitbash of movie 1 voyager Incernerator. It's a custom from a member of this board. Can't remember who but if you dig into the Radicon section, it will pop up on there. It's a custom, using Movie 1 Incinerator as a base. It was posted in the Radicons art section awhile ago. Cool, thanks...they way it seems on that site with the custom box with the wrapping on the box I thought the pre-orders should be popping up on TF Source and BBTS or something. Great job to whoever did the custom work. Had me fooled for sure that this was legit. It's clearly a kitbash of Movie Incinerator. It's a custom. He used Incinerator as the base figure. Also, dead giveaway: where it says "Product Copyright" in the upper right corner, it has the guy's name, Tsang Kin, instead of FansProject. Meh, I am not a big fan of the Masterpiece Mugen Calibur. I wanted something updated, and armed to the teeth. Like Stormbringer style Roadbuster. Oh well. As others have said, it's definitely a custom. But I definitely wouldn't mind if it were mass-produced. It's a custom. It was posted here before. I'll try to post a link. There it is. I believe he was the same guy who did a Guzzle from Classics Tank Megatron.